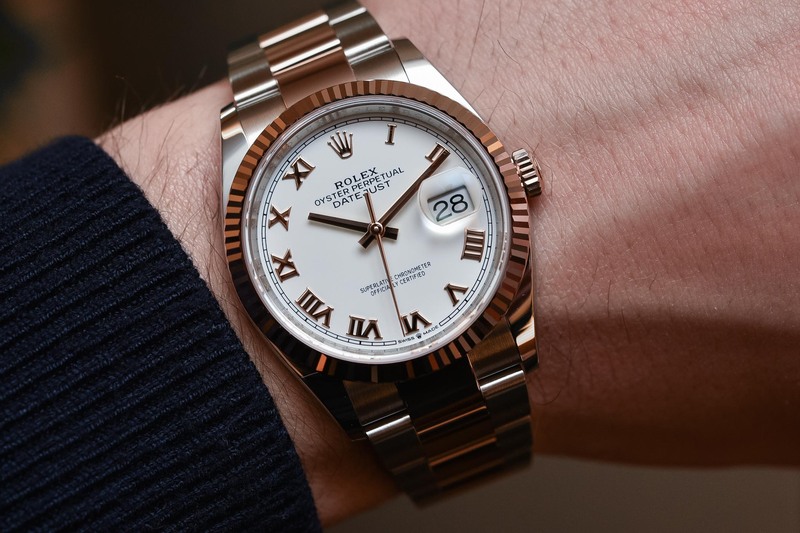 The 2018 Rolex Oyster Pereptual Datejust 36: Is This the Perfect “Boyfriend’s Watch”? 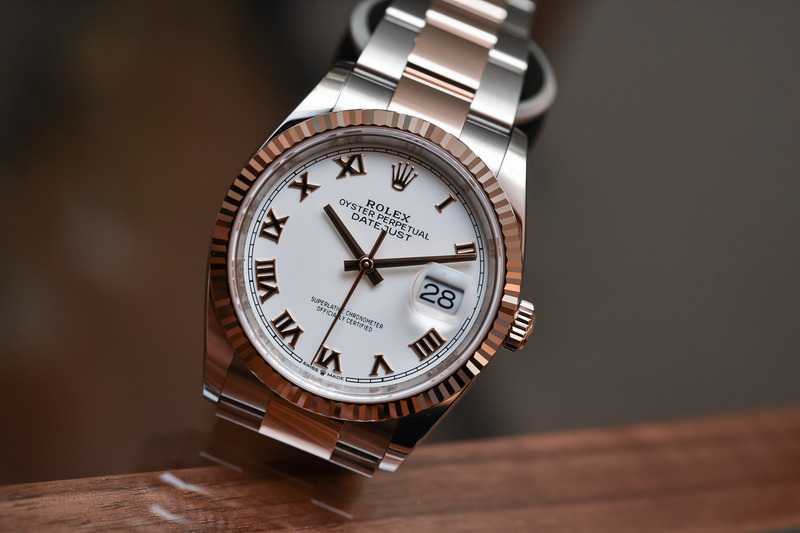 Women’s Watch Wednesday The 2018 Rolex Oyster Pereptual Datejust 36: Is This the Perfect “Boyfriend’s Watch”? Handsome, strong and always on time, the Datejust 36mm is the kind of watch women will want to borrow from their boyfriends – and keep. Having recovered from the jubilation following the release of the steel GMT Master II Pepsi during Baselworld 2018, we can now turn our attention to another candidate in the classic Oyster Perpetual Datejust 36 line that is out to conquer the hearts of men… and women. 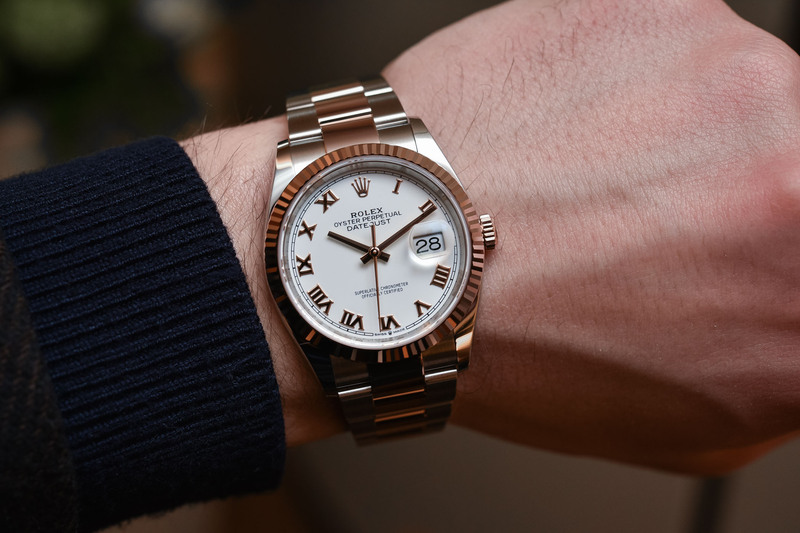 Housed in a two-tone Everose Rolesor case (combination of steel and pink gold), Rolex has fitted the watch with its new-generation calibre 3235 and given the case some design tweaks. Handsome and refined with just the right touch of luxurious rose gold, practical for everyday wear and tear, robust and ready for action sports yet with enough style to work as a casual dress watch… what’s not to love about the Datejust 36? So, a word of warning to all you boyfriends out there: do not leave this watch unattended. What woman hasn’t borrowed her boyfriend’s shirt, his jeans or snuggled up in his large cashmere sweater? The phenomenon of women poaching things from their boyfriends has trickled all the way down to the watch industry with more and more gender-fluid proposals. Chanel tapped into the trend and went as far as designing the BoyFriend watch for women (and we know that when it comes to creating trends, Chanel knows one or two tricks). Designed to look like a man’s dress watch that women would want to steal, the success of this watch has been extraordinary and a reverse effect in happening as more and more men are succumbing to the model, including the sophisticated skeletonised version of Chanel’s BoyFriend. 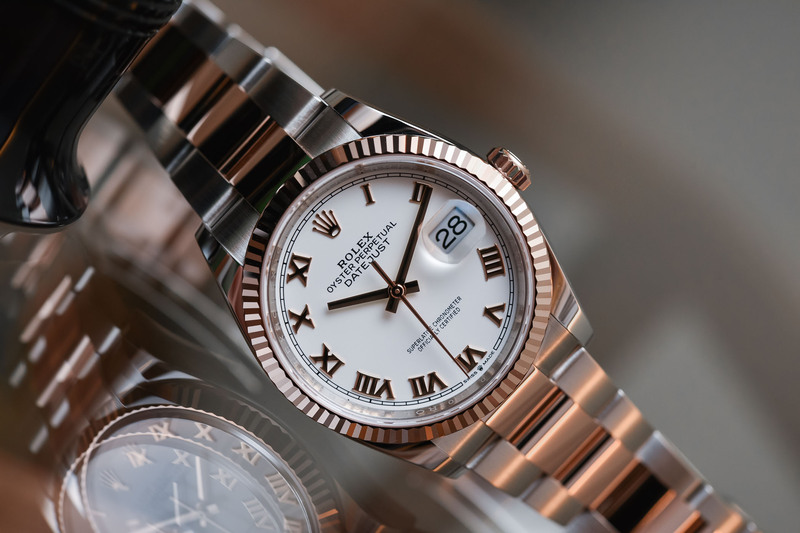 Surprisingly, coming from the bastion of conservative Swiss watchmaking, Rolex has always known that men’s sports watches would be adopted by women and has responded by releasing the Oyster Perpetual in five different sizes, from 39mm to 26mm to make sure nobody’s wrist is overlooked. For the record, when Rolex introduced its revolutionary waterproof Oyster case in 1926, it was put to the test on the wrist of a young Englishwoman – Mercedes Gleitze – to accompany her on her epic cross-Channel swim of 1927. 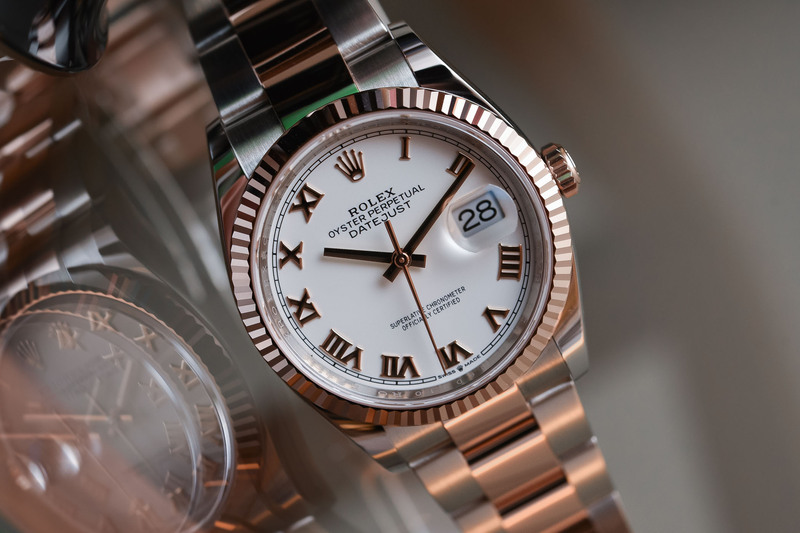 What makes this Datejust 36 such a perfect boyfriend watch – compared to the other two variations on the Datejust 36 theme with diamonds and louder dials – is its tempered masculinity (Rolex presented three Datejust 36 models during Baselworld 2018, including two with diamonds – see them here). It is masculine, but not butch and will look great on a woman’s wrist. Like a crisp white shirt, the white lacquered dial looks impeccably smart and confident, and the thick, pink gold Roman numerals give it a classic, authoritative spirit. In my book, this model is quintessential elegant Rolex and displays all the right markers of its heritage. As the first automatic waterproof chronometer wristwatch to display the date in a window at 3 o’clock on the dial, the Datejust has been going strong since its launch in 1945. 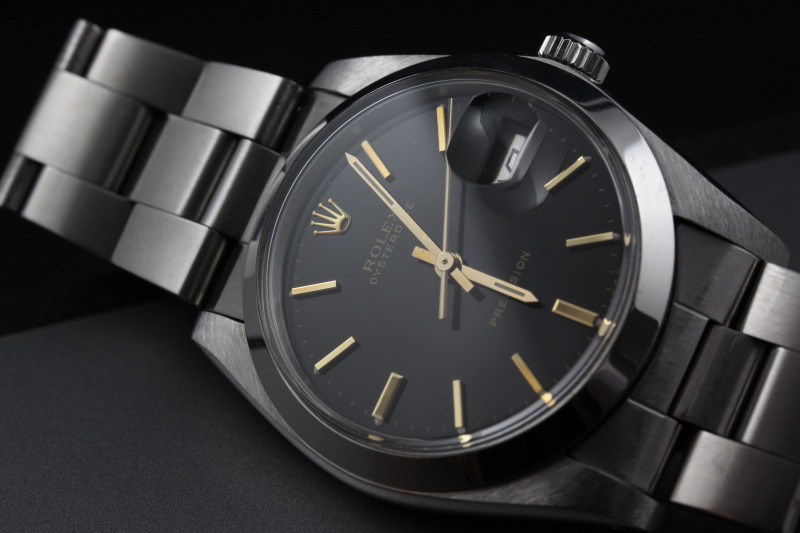 The model we are looking at here is a Rolesor, the term Rolex gives to watches that combine gold and steel. 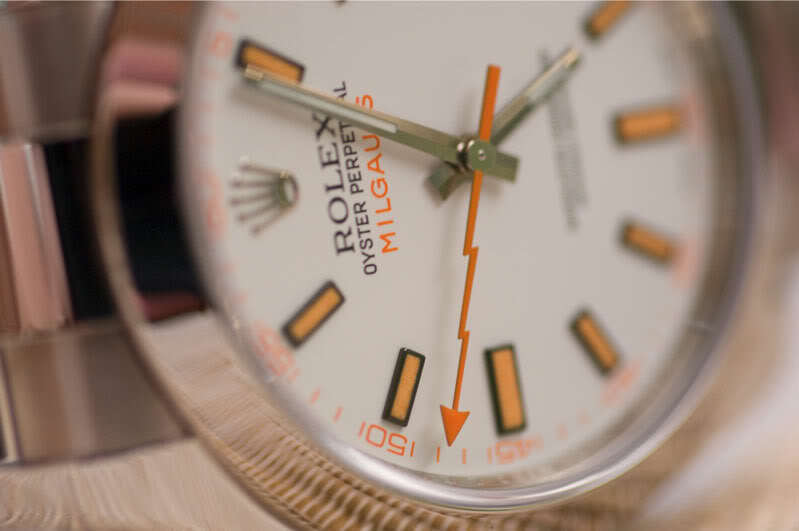 First introduced on the Datejust model in 1948, Rolesor offers a strategic alliance of luxury and resilience that are quintessential features of the brand and has contributed to the legendary status of this classic watch. This Datejust 36 model features 18k Everose gold on the fluted bezel, the crown and polished central bracelet links, while the case and outer links are crafted in hyper-resilient Oystersteel (the new name for the 904L steel). The case is a robust Oyster case with a hermetically screwed down caseback and a Twinlock crown to ensure it is waterproof to depths of 100 metres. You will notice that the case and lugs have been revisited and are slightly slimmer and more tapered than in previous models, as well as a thinner bezel – just like the 41mm Datejust two years ago and the Day-Date 3 years ago. And none of us can complain about that. 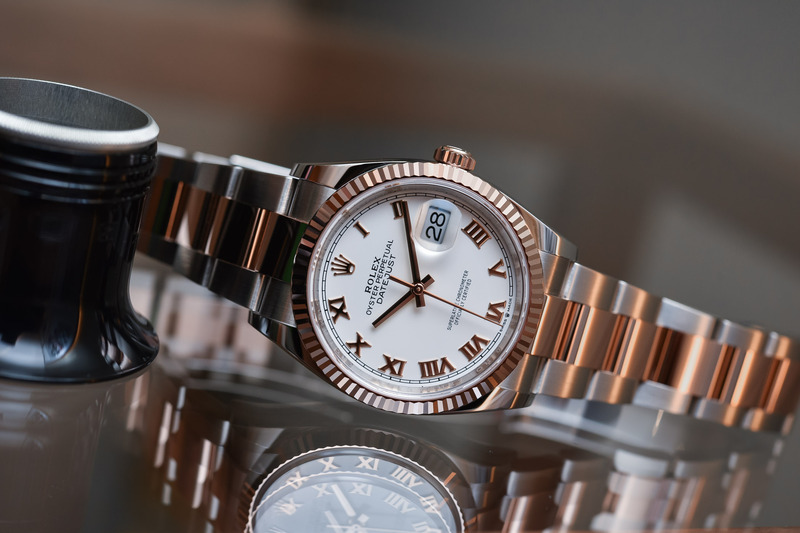 All the new Datejust 36 models are fitted, for the first time, with calibre 3235, the latest-generation movement developed and manufactured by Rolex with improvements in precision, power reserve, resistance to shocks and magnetic fields. Also used in the Datejust 41, this automatic movement features a perpetual rotor and new barrel architecture for a power reserve of 70 hours along with anti-magnetic materials like a nickel-phosphorous escapement and a paramagnetic hairspring. 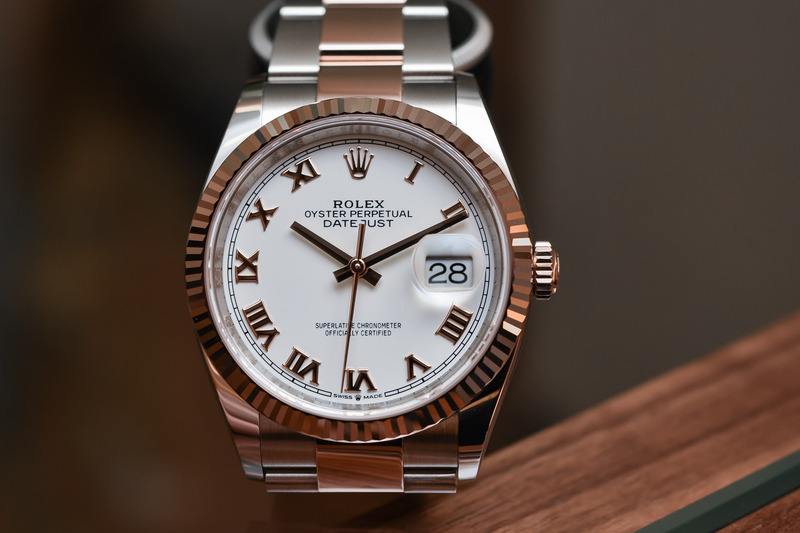 Certified as a Superlative Chronometer by Rolex offering precision of -2/+2 seconds per day, the watch is also COSC-certified and comes with a five-year guarantee. Offered with either an Oyster or a Jubilee bracelet and the convenient Easylink rapid extension system, my choice would definitely be the elegant three-link Oyster bracelet – to even enhance the boyfriend look. 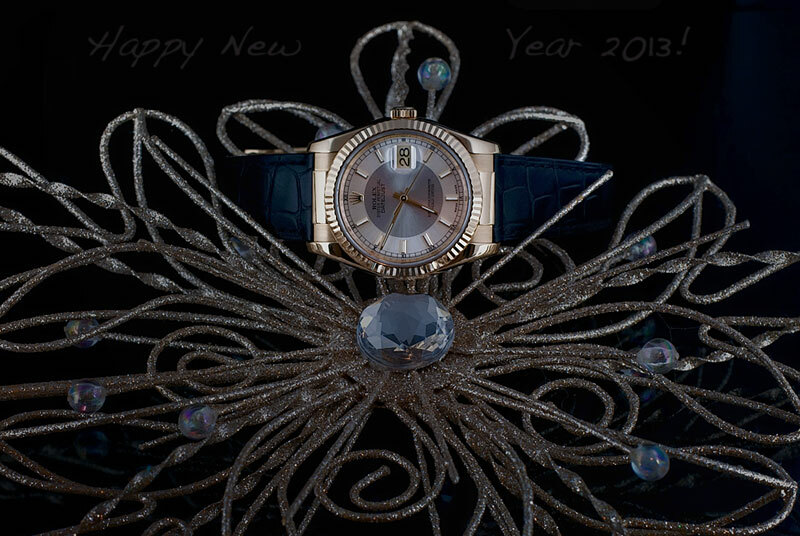 The present Everose Rolesor Rolex Oyster Perpetual Datejust 36 (ref. 126231) retails for EUR 10,000. 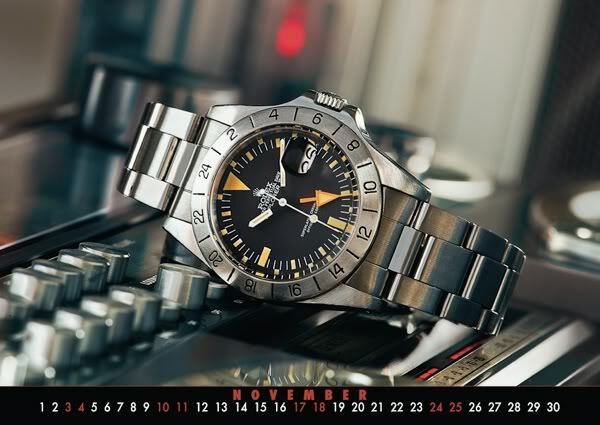 Please consult www.rolex.com for up-to-date prices in your country. Eh? Because women need to be ‘given a watch by their boyfriends’ (or ‘take it from them’) as opposed to being fully capable of making their own considered buying decisions and as successful professionals (in whatever field) going out and purchasing it themselves? The worlds has moved on from old fashioned stereotypes I’m afraid. The tenor of this article is all wrong. Is the author in his early-mid twenties? It surely reads like it. 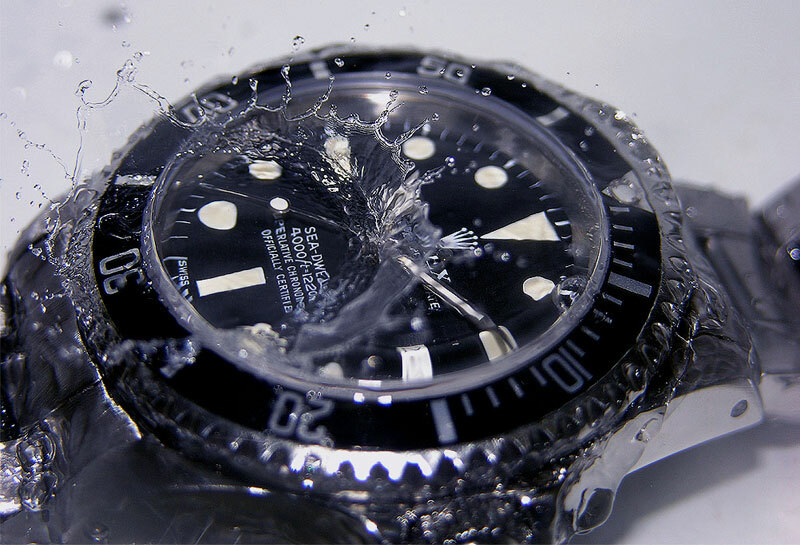 A 36mm oyster is one of thee classic cases in the watch world. To write about this new watch as if it is a fast fashion dress is insulting. Mr. Lawless is correct. A woman likes what she likes and will get it on her own, IMHO. Does Rolex not know what the symbol for ‘Four’ is in Roman numerals??? Sticks out like a sore thumb if you ask me, but what do I know…looks nice other than that, but for 10 Grand, think I could do better…just saying! @EW Billings… many watch brands use “IIII” for four. This goes back a long time in the history of watchmaking and there are various explanations for this. Gorgeous piece but not a great write-up. My wife has purchased just as much jewelry and watches for herself that I have purchased for her. Any women not trying out for the NFL would never look good in a 36mm especially a Datejust. I’m not sure why the “fashion scene” is pushing this as it looks awful. I’ve seen women wearing these larger watches and it looks as if they just stole their husband’s or boyfriend’s watch. Also, any woman who has a wrist big large enough to wear a 36mm Datejust needs to visit Weight Watchers or Jenny Craig. My wife is 166cm tall, but when I buy her a watch she needs at least four to five links out taken out of a women-sized watch – I’m talking a typical women’s tank watch. I’m 190cm tall and my largest watch is 42mm, so a woman wearing a 36 Datejust just looks totally retarded. Relax, guys. A female author wrote this article, FYI. I’m sure she didn’t mean it to sound so gender-based and all. We should focus more on the watch itself and not about how she used some expressions intended for humor.